So, this weekend Mrs. Pointsninja and I had an unusual experience at a hotel. In Birmingham for a concert, we stayed at a hotel near UAB. After the show, we walked back to the hotel, across the street from the UAB Hospital Emergency Room. As we walked in, we noticed that there was a single police vehicle in the street with its emergency lights on. Shortly after we reached our room (which faced the street), we noticed that several more police cars had arrived and officers had stopped traffic. 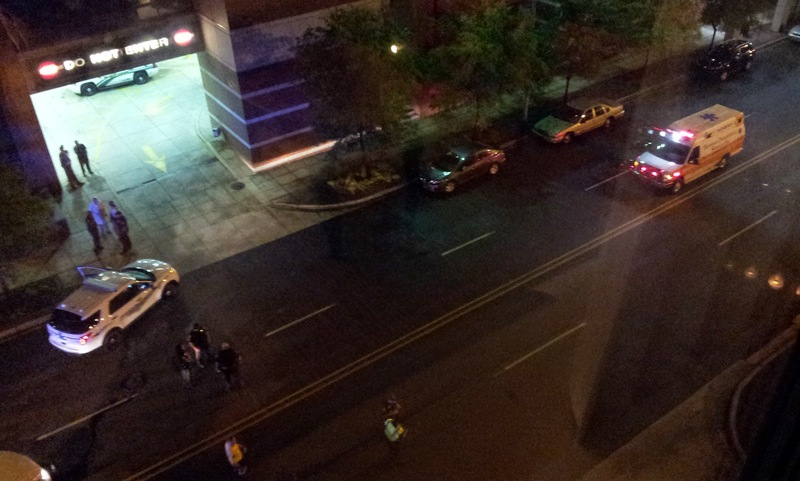 As we watched, an ambulance pulled up and parked in the middle of the street. Curiously, it just stayed there. While I was standing in the lobby, the hotel staff was discussing what they should do about the request to keep people away from the windows. The dilemma was this: the people looking out the windows were awake, but (this being after midnight) many other guests would be asleep. So, what to do? Call every room? Start knocking on doors? Eventually a manager came down and quickly decided what the hotel would do. And what did they decide to do? Nothing. Since the "bomb" was actually a non-explosive practice grenade, this turned out to be the right call. Waking people up to tell them about the threat would have alarmed them and probably would have resulted in guests leaving/checking out (at least one group did so while I was downstairs). BUT neither the manager nor the front desk staff knew that the threat wasn't real at the time. Should they have risked notifying their guests? Maybe the reasonableness of the manager's decision is reflected by what I did. What did I do? I went back upstairs and went to sleep in my room facing the street. Why? Well, the police were being officially cautious, but they weren't actually being cautious. Officers were standing around drinking coffee and chatting out in the open. Hospital personnel were milling about. The street was closed to traffic, but not to pedestrians. That's not what you do when there's a genuine threat of an explosion. Because of that I discounted the threat and went to bed. I can only hope that the manager's decision not to act on the police request arose from a similar thought process.